240 pages | 8 B/W Illus. Since the early 2000s, authoritarianism has risen as an increasingly powerful global phenomenon. This shift has not only social and political implications, but also environmental implications: authoritarian leaders seek to recast the relationship between society and the government in every aspect of public life, including environmental policy. When historians of technology or the environment have investigated the environmental consequences of authoritarian regimes, they have frequently argued that authoritarian regimes have been unable to produce positive environmental results or adjust successfully to global structural change, if they have shown any concern for the environment at all. Put another way, the scholarly consensus holds that authoritarian regimes on both the left and the right generally have demonstrated an anti-environmentalist bias, and when opposed by environmentalist social movements, have succeeded in silencing those voices. 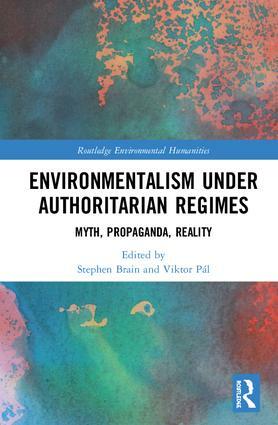 This book explores the theme of environmental politics and authoritarian regimes on both the right and the left. The authors argue that in instances when environmentalist policies offer the possibility of bolstering a country’s domestic (nationalist) appeal or its international prestige, authoritarian regimes can endorse and have endorsed environmental protective measures. The collection of essays analyzes environmentalist initiatives pursued by authoritarian regimes, and provides explanations for both the successes and failures of such regimes, looking at a range of case studies from a number of countries, including Brazil, China, Poland, and Zimbabwe. The volume contributes to the scholarly debate about the social and political preconditions necessary for effective environmental protection. This book will be of great interest to those studying environmental history and politics, environmental humanities, ecology, and geography. Stephen Brain is an Associate Professor of History at Mississippi State University. He received his PhD from the University of California, Berkeley in 2007. His first book, Song of the Forest, was published in 2011. Viktor Pál received his PhD at the University of Tampere, Finland. Currently he is an international postdoctoral fellow at the Laboratory for Environmental and Technological History at the Higher Schools of Economics in St Petersburg, Russia. His first book Technology and the Environment in State-socialist Hungary: An Economic History was published in 2017.